China has a packaging problem. I don't mean a branding problem. I mean the materials that companies cover their stuff with. Consider the ubiquitious and essential mooncake, which during Mid-Autumn Festival is given as a gift to and from government officials, company bosses, journalists and, last but not least, family and friends. The cake is an essential part of the holiday -- much like America's fruitcake -- and is, as far as I can tell, about as loved. 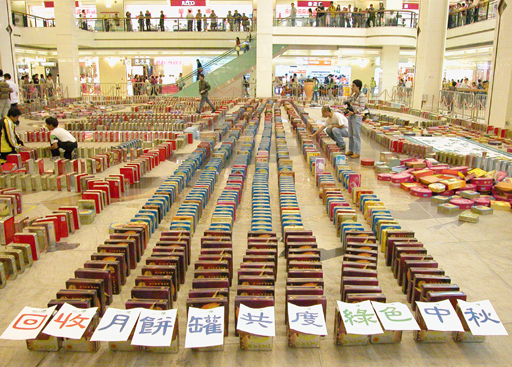 Fortunately, as Imagethief points out, due to their long shelf lives -- and their firm role in China's gift economy -- mooncakes and many other packaged baked goods in China are easily regiftable (ie, recyclable). And again like fruitcake, "recycled" they are -- often. But according to a new law -- which reprises previous attempts with more force -- local authorities are responsible for banning products with excessive packaging. Reports CCTV, "According to the new rules about restricting the over-packaging of goods, there cannot be more than three layers on a package. And the cost of the packaging cannot exceed 15 percent of the sales price." Aside from apparently coinciding with an international snack packaging fair in Shanghai, the regulation comes alongside the passage of a long-discussed "circular economy" law, which provides a legal framework for developing the economy while raising energy efficiency and protecting the environment. The devil, as usual, is in the details of enforcement. Like the new and related circular economy law, which I'll cover in an upcoming post, the success of this regulation will depend on how well the government is able to get companies to change their packaging, manufacturing and recycling practices. Already, it seems, mooncake manufacturers have obliged. Opulent mooncake boxes have "disappeared from the market," says CCTV. Done and done. Everyone can go home now with their affordable and at most three-layered package of mooncakes. As Xinhua reports, luxury-minded customers can still find excessively packaged mooncake boxes -- they just go by a different name: "...some moon cake producers and marketing businesses have come up with a clever deception: "red wine gift boxes," "tea boxes" and other ways to conceal luxury moon cakes in legitimate packaging." As usual, with a little linguistic manipulation, enterprising manufacturers are one step ahead, supplying opulently-packaged mooncakes to a middle and upper class eager for fancy boxes. Luxury mooncakes have also been available online. As the only "related link" on its mooncake packaging story, state-run Xinhua does offer one example of more sustainable packaging that might interest consumers: "Employees wear only aprons for less packaging use," reads the website's too typical headline over a slide show of scantily clad women at a green PR stunt. Banning luxury mooncake packaging is a good step forward for China. Like bans this year on smoking and plastic bags, the government has sent a strong message about a unsustainable practice, a message that can only get stronger. For the short-term however -- as long as demand for luxury mooncakes is there, and it is -- the ban will not exactly be effective. But if it does prove to be a success, considering how few of them are actually eaten, government officials might also consider banning the cakes themselves. Then perhaps they would get more gifts they can actually use -- like Rolexes or Mercedes.